So it's been a loooong while since I last posted on here, but if any thread deserves my attention it's this one. It was an absolute pleasure to be able to assist with the Ulimates tournament for the 3 years (I think it was 3!?) that I did. A massive thank you to Luke for putting so so much effort into the community over the years. Ultimates was a massive success in everything it aimed to achieve. Helping out with Ultimates stands out as some of the best hobby experiences I've ever had, it was great to feel like a part of something so fun and rewarding. Genuinely sad to see it go, but I look forward to whatever secret project comes next. I am as sad to hear the Ultimates has come to an end as anyone, but have decided to focus this post on saying thanks to the people who have worked tirelessly to make it possible over the last eight years. I was fortunate enough to attend several of the Ultimates, and despite having also been to the national masters and the ATC can honestly say I have never seen such a professional, smoothly-run and well organised event. I can only imagine the amount of work that had to be put in in the weeks and months before the tournaments, the effort that was required to make these weekends the absolute pinnacle of the WA tabletop gaming year, and am sure it has been appreciated by all the contestants as much as it will now be missed. 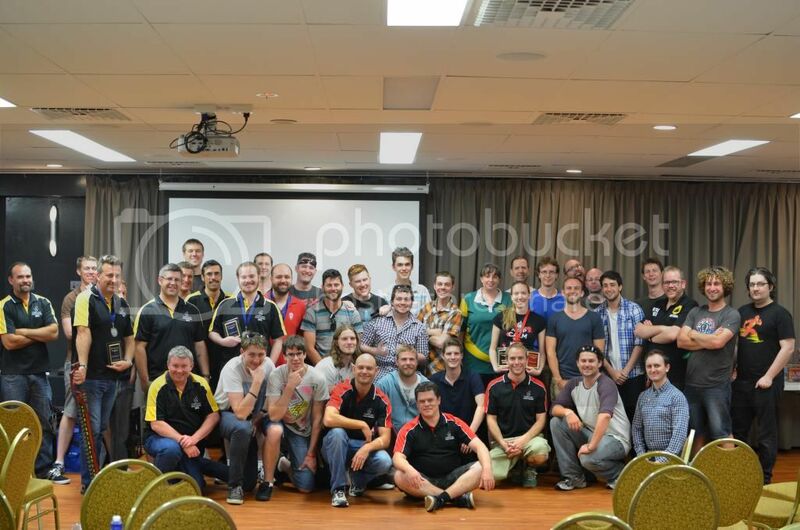 Thanks for running an event of such quality and broad appeal that it actually had an impact on almost all the other tournaments in Perth, with an influence on rules, the quality of painting (ultimates-ready armies gradually lifting the whole field), the standardisation of points sizes and competitive scenarios. So thank you JJ, Mike and Christian, Ben, Simon, Adrian, Yordan and Ollie, and anyone else to contributed, but especially Luke for being such a torch bearer for tabletop gaming for so long. Well done, it has been appreciated and it will be missed. Thanks for running them Luke! Ultimates was awesome to attend a couple of years ago and even on the last weekend I was able to sneak in and check it out (Wife's Birthday) and just seeing all the painted armies and stands was awesome. Some of my highlights from when I attended. Getting refused entry back in just as it was finishing because I didn't have shoes. I thought I was lucky enough to survive until then! Glad they didn't check earlier. Playing all of my eCaine matches with 41 points instead of 50. Stupid Cyclone! I even painted the damn thing but never got around to ever playing with it at Ultimates. I can understand how you feel about letting it all go. I started running premier MTG events back in 2001 and only recently stopped running them a couple of years ago. There was a point where I was told (after about 12 years working with Wizards) to piss off or join up with a shop. I was happy with the way I had run events, but after partnering with a store I felt the events declined and we had a weekend where I almost lost $7000 simply because the store hadn't paid for the stock in time. We managed to get it from the Airport around 10pm the night before the event... and the store was planning on doing a Midnight Launch event. That was the final straw for me so I bowed out, I was now working full time so didn't need the cash from Wizards anymore, plus Good Games had just come along and they were doing a fantastic job with promoting and organising events. I had to re-evaluate all of this again recently when I got asked out of the blue by another store if I wanted to start running events again. Did I want to put myself through the extra work and hassle of finding a venue that was available for the whole weekend? That was always my biggest hurdle... Bassendean was always the back up, as I could rarely find other venues suitable. Wizards frowned on running events in licensed places due to the large under age population. I must admit, I was tempted, but only because I still have a student loan, and I'm paying a decent amount in child support still. But also because I did miss the chaotic nature of running an event with so many variables and seeing people having a great time as they smoosh their opponents to death on Turn 4 using the ultimate blade of cool things (tm). A couple of stand out moments from running events for me. Hiring the Joondalup Library until 8pm only to have the electricity automatically turn off at 6pm leaving us all in the dark. When I got back from trying to find the security to find out what was happening I walked into a room of 60 people all playing by the lights on their mobile phones. Lights be damned! Explaining to hundreds of parents over the years about the game and then just giving up when they go "So it's just like Pokemon with monsters and hobbits?"... "Yes! That's exactly it!" Driving to the venue only to realise I have to turn around and drive back home to get the keys (I was only 40 minutes late. Realising I had no change for the weekend and running around buying $1 packs of things at various shops with $50 bills asking for the change in $5 notes! Sorry to hear this news as Ultimates was a fantastic event and included the best WFB tournament I have ever attended. Given my lapsed interest in WFB I was a johhny come latecomer to this news until bumping into Luke in the city. Thanks to all who were involved especially the organisers Luke, JJ, Mike, Ben, Simon, Adrian, Yordan, Ollie, and anyone else to contributed. Those events inspired my hobby to ridiculous heights (my wife called it a mania) and many pleasurable games were fought and laughter shared. I doubt I ever could convert and paint that many figures to that standard again! The event had so many great elements - firstly the concept, best of best tournament which inspired a regular tournament circuit and fostered a sense of building anticipation as the year progressed. It totally encouraged hobby + sportsmanship, in its player packs and tournament organisation, and the standard of painted armies got better and better as the years rolled on. The terrain and boards, the missions, blind deployment (Ben is right the groans went up as you saw your opponent huddled away on the wrong flank for your strike troops) and don't forget the music. The 2009 tournament was my favourite event, I liked the smaller venue as it was not as noisy as the bigger venue although I totally saw the benefits of combining the event into one weekend for organisation purposes. So thanks again for many great gaming memories and best of luck with the new project. Ultimates 40k winners is now just a very small and exclusive club! I would suggest the same thing for Warmachine but only one person would get a shirt. True champions don't need shirts to advertise it.